After what feels like an eternity locked away, Clare Maguire is ready to come out to play and I reckon we are all gonna be scrambling to join in the experience that is the beautiful voice to behold us. The exciting news is, Clare Maguire is going to be supporting Plan B on his October 2010 tour and Hurts early October 2010. Get ready, Clare Maguire, on Polydor Records debut single Ain't Nobody is out on 18th October 2010. More on Clare Maguire from LikeTheSound here. This is an absolute classic song of immense greatness born from The Streets 2008 album Everything Is Borrowed. Filmed at London's Camden Roundhouse for The Electric Proms. The Streets - The Strongest Person I Know. Hard Way is the first video taken from South London's Hip Hop/Grime artist Stylah's forthcoming album out in September 'Treading Water' produced by Show N Prove! Hard Way opens up with a really tranquil line of music before Stylah pushes in to warn us "Blame the system not the people!" the song hits out with some blinding lyrics, truths and beats. Stylah, who is rapidly regarded as one of the hottest talents in the UK, earlier this year collaborated with Mr Hudson – Anyone But Him and also did a Stylah remix of Tinie Tempah's - Pass Out. This is the video for Eminem's fantastic number 1 single "Love The Way You Lie" Ft Rihanna who appears in the video as well as Megan Fox (Transformers) and Dominic Monaghan (The Lord of the Rings, Lost) Playing a couple going through the extremes of an abusive relationship. Yesterday, Eminem received 8 nominations for the 2010 MTV Video Music Awards. This is so well deserved, a true provider and leader of talent. 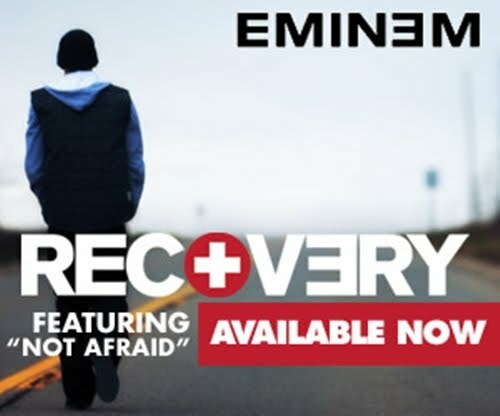 Recovery is available on iTunes now.